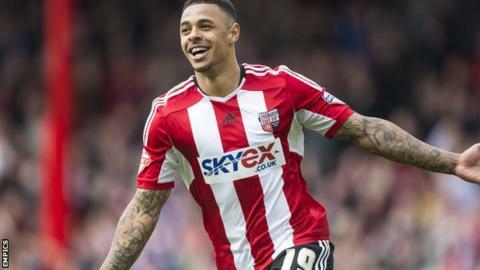 Hull City boss Steve Bruce is still hopeful of signing Brentford striker Andre Gray, despite admitting the deal has hit "a stalemate". Gray, 24, scored 18 goals in 50 appearances last season. He scored as a substitute in the 2-2 draw with Ipswich on Saturday, but was left out of the Bees' squad for the 4-0 League Cup loss to Oxford. "Transfers seem to take forever now but we're hopeful it's still alive," Bruce told BBC Radio Humberside. "It has hit a bit of a stalemate but he's their player, so it's their prerogative." Brentford head coach Marinus Dijkhuizen said the former Luton player was omitted from their squad for Tuesday's League Cup tie because of "the problems with him going off or not". The Dutchman told BBC London 94.9 after the match that there was "no news", but when asked if he hoped Gray would remain at Griffin Park, he replied: "Yes, of course, otherwise we have a problem. "We have just Philipp Hofmann and I did not want to make a risk with him [against Oxford]. If I take a risk with him I may have no striker for Saturday." The Tigers signed Bees full-back Moses Odubajo, 22, last week and he made his debut in their penalty shootout win over Accrington on Tuesday.